The strong resemblance of Kim Jong Un (right) to his popular grandfather Kim Il Sung (left) may be subliminally creating warm feelings among his followers. Photographs show he has his grandfather’s double chin and dark eyebrows, and his haircut supposedly is a throwback to the older man’s style in the 1940s. 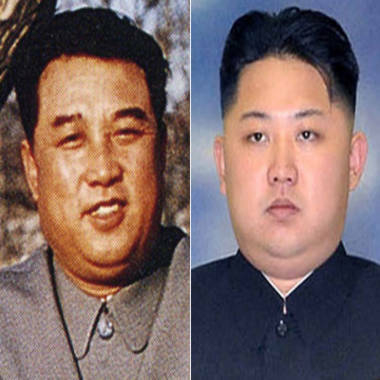 Some reports speculate that Kim Jong Un has even undergone plastic surgery to make him look more like his popular grandfather, North Korea founder Kim Il Sung, and less like his father, Kim Jong Il, who was not as well-liked. Whether the resemblance to his grandfather has been inherited and/or surgically enhanced, it sure can’t hurt Kim Jong-Un, his late father’s handpicked successor to lead North Korea, psychologist Robert Bornstein says. He'll likely benefit from the experience many of us have had of feeling warmly toward a person we’ve just met simply because they resemble someone we like. Psychologists call this phenomenon “the mere-exposure effect,” as in the mere exposure to someone or something leads to liking him or it. “It’s actually very powerful,” says Bornstein, who’s been studying the mere-exposure effect ever since he wrote his dissertation on it in the 1980s. There are 300 to 400 studies in the scientific literature about the phenomenon, mostly having to do with visual and auditory--“things like voices, accents, the cadence of a person’s voice”--characteristics. “If it rings a bell, then we do have this initial reflexive response to it,” Bornstein says. In other words, when it comes to North Korea dictators, like grandfather, like grandson. Have you had a rush of affection for a stranger just because they look like someone you care about? Tell us on Facebook.